Why not kick off the new year with a terrible pun, amirite? Truth is, most of us are quite ready to leave 2017 in the dust and venture forth into a fresh start in 2018. And what kind of fresh start would it be without a quick peak at what will prevail in the world of interiors over the next 365 days? Ok, that's a stretch. Truth is, we have a real love/hate situation going on with trends. We try to avoid using them as a crutch when it comes to interiors because ultimately creating something you can live in and love for many years is the goal. But on the other hand, there is really no such thing as timeless. Think about where you lived in the early 80s, for example. Would it hold up today? In some cases, it might, but only if you've kept at least a baby finger on the pulse of trends and made on-going, significant updates to keep the look current. As always, everything in moderation. Here are eight hot trends to choose wisely from this year. Because it's 2018 ya'll! And 18 trends was just too many. Pantone colour of the year (Ultra Violet 18-3838) be damned! The people (of Pinterest that is) have spoken and the real 2018 colour of the year to lust after is Sage. The subtle, soft greyish green is about to bedeck bedroom, den and living room walls galore, bringing with it a sense of calm and quiet that no purple could ever hope to provide. However, if Ultra Violet is your jam, we're not mad at it. Use it sparingly on accent pillows and stoneware. It'll go gloriously with your new sage walls. This trend had a flash in the pan a few years back with painted and wallpapered ceilings (still love when done right) then faded to the background a bit while patterned and papered wall treatments took centre stage. But in 2018 we're going to see a lot of attention focused on the ceiling. Hopefully this means we'll all be kicking our feet up more often and gazing up from the comfort of our beds and sofas, but we suspect that's not the case. More likely it's just that neutral white walls are always a design staple and the ceiling is often overlooked as a super-stylish way to add punchiness and architectural detail to an otherwise neutral room. There's no denying that a trend toward oversized art often requires an oversized bank account. But, BUT, if there's one thing that you do for your home this year, and if you have the wall space to accommodate it, consider a great big piece of art. It doesn't have to be a gallery-worthy masterpiece (though if you want one, we can help you source it), just something that speaks to you, that evokes emotion, and that fits your home and your budget. Whatever it is that works for you, just make sure you go big or go home. Don't know that greenery has ever been out of style per se, but a well-placed plant can take a room from plain to perfect. Don't make us post a gallery of fiddlehead fig tree shots to prove a point (ok, maybe we'll do a separate post). This year, however, the devil is in the details. Plants with intricate detailing like shimmery veining on leaves and other patterned and showy foliage are going to elevate your houseplants from accent piece to feature item. Start stretching those green thumbs, the showiest varieties, such as jewel orchids and prayer plants, are not always the easiest to care for. You read that correctly. After at least a decade of white or light kitchen counters and cupboards, dark and moody is making tracks back into the decor ethos. That's not to say it won't take some mettle to commit to this trend in your own home, it will, but when the space is right and your choices are made wisely, this is a bold statement that will most certainly secure you a place in trendsetter hall of fame. A reflection of the general move toward more organic materials and shapes, the shift away from straight lines and toward a softer, plusher, sexier curve is going to be all the rage in 2018. Look for velvety swivel chairs and sofas with curved arms and rounded backs. Incidentally, these soft statement pieces are perfect when paired with one of 2017's most pervasive trends, millennial pink. Wish we could in good faith write: black is back! Because, rhyme! But we cannot in good conscience ever say that black was out of style. 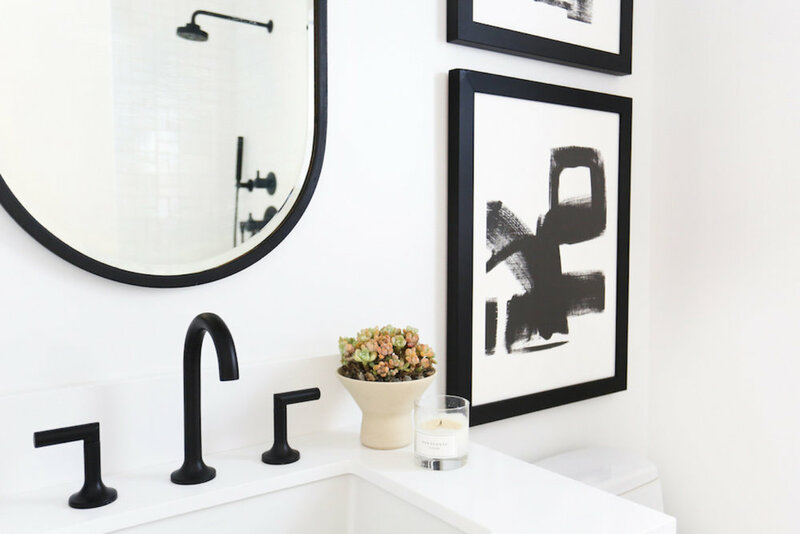 What is specifically going to be trending in black in 2018 are fixtures. Say bye-bye to brass (okay, not all the brass, we still love brass) and hello black on kitchen and bath hardware, light fixtures and metal finishes on accent tables and chairs. What this trend is really indicative of is the on-going strength of minimalism. Matte black metal is modern, stark, simple, and makes a big impact with minimal flash. Not to be mistaken for actually perfect, picture perfect means just as it says, perfect for pictures. Or more specifically for Instagram. If you have a gorgeous and original statement piece in your home and you don't post it on Instagram, is it even real, bro? Any room can be made picture perfect by following a few basic rules, fluff your pillows, add flowers or greenery, wait for the light. Oh, and a well placed pet will always rack up the likes. As always, if you need some help interpreting this year's trends and finding the best way to use them in your own home, we've got you covered. CONTACT US. Wishing you a joyful, healthy, cozy new year to each of you from EMME Design!